Tense talks between Russian Foreign Minister Sergei Lavrov and U.S. Secretary of State John Kerry in Geneva saw both sides express hopes that the ceasefire in eastern Ukraine would hold, but were characterized by a lack of concrete progress, with Lavrov attempting to persuade the U.S. to apply pressure to Kiev and Kerry threatening further sanctions. Russian Foreign Minister Sergei Lavrov and U.S. Secretary of State John Kerry have both expressed optimism that the ceasefire in eastern Ukraine will hold, following talks in Geneva at which the differences between the two sides on how to uphold the truce continued to obstruct clear progress. The foreign ministers met twice during the course of the talks in Switzerland on March 2. In addition to the situation in the Donbass region of Ukraine, they discussed the state of affairs in Syria, the fight against radicals from the Islamic State group (ISIS) in the Middle East and Iran’s nuclear program. 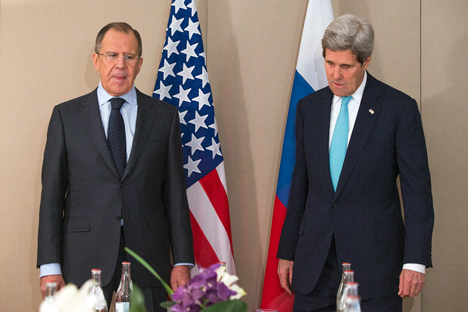 However, the main focus of the talks was the issue of the observance of the ceasefire in eastern Ukraine. According to Lavrov, he asked Kerry to use his influence over Kiev for the full implementation of the terms of the truce by the Ukrainian side, providing for a ceasefire and the withdrawal of heavy weapons. According to the Russian Foreign Ministry, during the talks Lavrov also reminded his American counterpart "of the obligations of Kiev regarding constitutional reform and the provision of special status for the Donbass." Kerry expressed hope that the full implementation of the truce was a matter of "hours.” At the same time, he threatened Russia with new economic sanctions. The U.S. Secretary of State said that Moscow will face "further consequences" if the conditions of the ceasefire are not met in full. In Geneva, Lavrov also took part in the U.N. Conference on Disarmament and a session of the UN Human Rights Council. Responding to questions from journalists, the minister commented on the content of the Council's new report. According to the Russian minister, some of the points in the document need to be clarified. "For example, the report refers to credible sources on the presence of Russian troops in Ukraine," he said. According to Lavrov, "not so long ago none other than the Chief of the General Staff of the Armed Forces of Ukraine has denied these reports and said there are no Russian army units in Ukraine." Lavrov also noted the restriction on the freedom of movement between the Donbass and other regions of Ukraine imposed by the Ukrainian authorities, which was mentioned in the report. Russia’s foreign minister reacted to this step taken by the Kiev authorities with criticism. According to Alexei Arbatov, the head of the Institute of World Economy's Center for International Security, the parties focused on those points that they considered priorities for themselves when discussing the implementation of the Minsk Agreements in Geneva, and a number of sticking points remain. "Both argue about the constitutional reform and local elections under the agreement in Minsk," Arbatov told RIR. The U.S. insists on the fulfillment of provisions for the withdrawal of all foreign troops and the return of the control over the border between Russia and the Lugansk and Donetsk regions of Ukraine to the Ukrainian authorities. Russia, in its turn, insists on the withdrawal of the Ukrainian army. According to the expert, Kerry's threats of further sanctions are likely to be of a ritual nature. "There is an opinion in the U.S. that the pressure on Russia should not be decreased, otherwise, Moscow will not apply pressure to the rebels to comply with the Minsk Agreements," said Arbatov.